When I sat my first 10 day Vipassana meditation course I wasn’t expecting the amount of theory that was dished out every night in the teacher’s discourses. 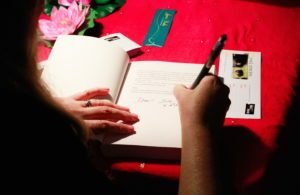 The Introduction to the Technique, required reading before sitting the course, stated that Vipassana had nothing to do with organised religion or sectarianism. But what was taught in those evening sessions was clearly Buddhist doctrine; the Eightfold Noble Path, the Four Noble Truths, the Three Stages of Wisdom, the Four Elements, the Six Senses, the Four Aggregates of the Mind. I couldn’t keep up with it all. Fortunately the teacher told us it wasn’t necessary to. We were to experience the technique for ourselves, give it a try and see if it worked for us. Then perhaps later, if it did, we could delve more into its depths. As part of delving into those depths, a few months later I visited The Chenrezig Institute in the Sunshine Coast hinterland. Established in 1974 Chenrezig was one of the first Tibetan Buddhist centres in the Western World. It’s home to a Tibetan Lama and a community of monks and nuns. After experiencing the Vipassana centre where there’s not so much as a stick of incense, no candles, no banners, no statues – nothing, Chenrezig was a shock with all its colour, prayer wheels and flags. When I went into the temple and was confronted with brightly painted devas, lotuses galore and prostrated monks I was astounded. From the ‘no distraction’ edict of Vipassana meditation to the garish busyness of Tibetan Buddhism, it was like visiting another dimension. All I could think was Buddhist monks must get really bored to have to invent all this stuff. My next visit to Chenrezig was to interview a nun for my radio series Soul Train, in which I investigate different religions and faith-based organisations on the Sunshine Coast. I spent a wonderful hour talking with her, sitting in the shadow of an ornate stupa. She had been studying Buddhism for over twenty years yet she told me she had only scratched the surface of all the theory. “It gets increasingly complicated,” she said. Bored monks, I thought to myself again. Bored and making stuff up. For my third and recent visit to Chenrezig I took my 13 year-old niece, her friend and my husband with me so they could experience it for themselves. The 13 year-olds took many photos and loved the fibre optic lotuses and the many faced statues. The Hubby, like myself, found the theory a needless distraction. But our opinions divided inside the stupa. 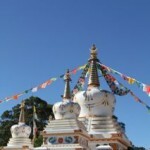 Stupas are the oldest forms of Buddhist architecture and they hold Buddhist relics and holy objects. 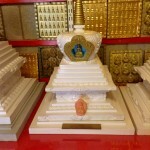 Inside the big stupas are smaller stupas which people can buy to hold their loved one’s ashes. I was delighted to find little stupas in memory of not only people but their pets. There were cats and dogs mixed in with their owners and sometimes with a little stupa all to themselves. The Hubby left, retreating from the heady incense, piped music and Buddhist knickknacks, while I stayed, fascinated by these memorials to beloved animals. When I found a little stupa dedicated to two Belgian Shepherds I was sold. We adopted our Belgian Shepherd from the RSPCA. She was six years old and had been abandoned. In the eighteen months since she became part of our family, we have discovered why she was abandoned. Anti-social, anxious and prone to biting other dogs. She loves us but no one else. We manage her behaviour, keeping her away from dogs and other people. Sometimes I wonder what goes on in her hyper-sensitive mind and whether she will ever find peace. Perhaps, years in the future, after she’s died from old age, I can put her ashes in a stupa and there, at last, she will be at rest.